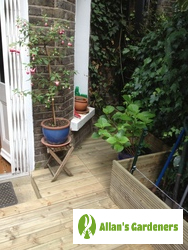 Get the garden you've always dreamed of with the help of Allan's Gardeners garden design team in Battersea SW11. You'll delight your neighbours with your well-planned front garden,and make the most of a private space when we work in your rear garden. Your home will look more attractive, you could gain a space that's perfect for outdoor entertainment, or just somewhere safe for the kids to play. Your garden will add value to your personal or rented property. We'll translate your ideas into a unique and bespoke reality, making sure that your garden looks good from the start and will serve you well for years to come. 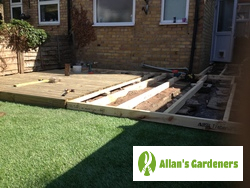 Allan's Gardeners offer garden design and other garden services in Battersea and in many surrounding areas too. Find us in: Wandsworth, Chelsea, Fulham, South Lambeth, Twickenham.